As I was reading Oliver’s post from a couple weeks ago, I became curious about the chemistry involved in repairing Art Thompson’s Boo-Qwilla. He mentioned a couple of products when constructing the mortise—in particular WoodEpox. What is this and how does it work? I became even more interested when Oliver described a fairly strong exothermic reaction that had occurred when the two components of another epoxy resin were mixed—it generated so much heat that, to quote Oliver, “the pot melted and the epoxy mushroomed out of the pot in a bubbly foam!” Exothermic reactions make for fun times for your average chemist (that’s me!) and so I set out to learn more about epoxy resins like WoodEpox. As a side note, this blog is certainly not advocating the use of one brand-name product over another—this just happened to be what the wood conservator chose for this particular project and it serves as a useful starting point to learning more about epoxy resins. As you can imagine, these products are proprietary and it’s difficult to find out what is actually in them. The first thing I did was consult the material safety data sheet (MSDS), which is available on the Abatron website. Like Oliver mentioned, there are two components that need to be mixed right before use. 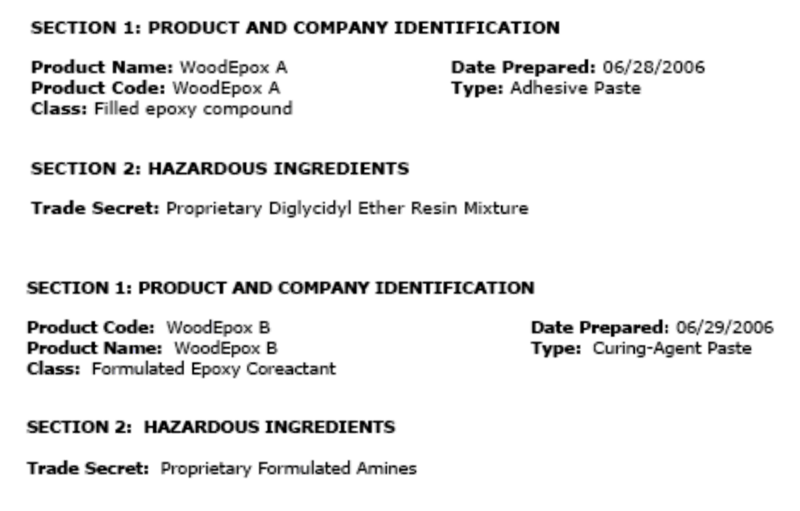 The MSDS for WoodEpox thus has two parts, A and B, and they are shown below. WoodEpox A is a “proprietary diglycidyl ether resin mixture” and WoodEpox B is “proprietary formulated amines.” What does that mean? Well, we won’t know exactly what is in each product but a Google search of “diglycidyl ether resin” proved helpful. The most common diglycidylether resin is bisphenol A diglycidylether, which is synthesized from epichlorohydrin and bisphenol A. As you’ll see in a moment, the most chemically important parts (or moieties) of this molecule are the terminal epoxides. These parts are necessary for the compound to harden so they probably will still be present in the “proprietary mixture.” The part that is variable is the linker, which is the bisphenol A part, highlighted below. As a side note, you might recognize bisphenol A (BPA) as that compound that’s been in the news a lot—Canada banned it from baby bottles and you might have purchased an aluminum water bottle to replace your old plastic one because of BPA. When mixing epichlorohydrin and BPA, the polymer chemist can control the size of polymer that is formed (the n below). If n is small, the polymer can be a freely flowing liquid while if n is large, it can be viscous or syrupy, or even a solid. The viscosity is important to how your product works—do you want the user to apply the material with a squirt bottle or a palette knife? The second part, WoodEpox B, is a proprietary mix of amines. Amines, like ammonia, are nitrogen-containing molecules. Amines can be generally classified as nucleophilic: they have a lot of extra electron density centralized on the nitrogen and they are always on the prowl for electrophilic molecules (literally electron-lovers) to share their electrons with. Turns out that epoxides are pretty good electrophiles and that’s how these epoxy resins work. Typically the amine part is a molecule that has several nucleophilic nitrogens like triethylenetetraamine (TETA). The instructions say to mix equal volumes of part A and part B. When you do that, you’re introducing the epoxide (part A) to the amine (part B). This is where the exothermic reaction comes from: the reaction between the two components is so favorable, i.e. lower in energy, that energy is released as heat. You can control how “extreme” this reaction is by the rate you mix the components and the size of the mixing vessel. The cool part of using a “Part B” that has so many nitrogens is that during the polymerization the molecule becomes highly cross-linked; this is because each of the four nitrogens can attack different epoxides thus linking up to four Part A polymers in a non-linear fashion. A highly cross-linked polymer is typically very strong. Imagine a long line of people, holding hands: if you forced any two people to let go of each others’ hand, the chain would be broken. If, however, there were the occasional four-handed-super-human in the mix, the chain of people would be linked in many directions and will not necessarily break if just two people let go. So the more bonds you form between people, or atoms, the stronger the overall complex is. Overall, it’s important to know something about the materials you are using. Knowing that you should expect an exothermic reaction when you mix the two components is important for your safety and will dictate how carefully you do the mixing. Understanding what these materials are made of will help you make wise purchases for the project you have at hand. Exothermic reactions in resin casting can really take you by surprise if you’re not prepared! Cast resin and fiberglass art in CAC’s collection, such as Ron Davis’ “Cornice” or Sam Richardson’s “Four Views of that Guys Land” have inspired many young artists to try out transparent polymers only to be rewarded with melted Dixie cups and a sticky mess 😉 Your point about cross-linked polymers gaining strength through multiple bonds reminds me of the processing power of a Beowulf computer cluster – computers ‘holding hands’ like people in your example. Thanks for the informative explanations!